It was a great day for the International 14 Team Racing at Takapuna, New Zealand today, with exciting competition in light southerly winds. The format was that the winner would be the first team to win three races out of five. 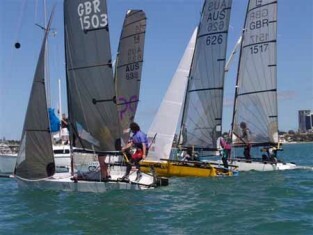 Australia took the first race and race two went to Great Britain A. The balance continued to tip back and forth as Australia won the third race, and Great Britain A the fourth. The tension was understandably high as the teams headed into the fifth and final race. There was a great deal of changing of position in the last race, but Great Britain A came through to win. Tonight all the teams will be celebrating at a dinner to be held at the oceanfront Takapuna Boating Club facility. While they wait, team members will be watching videotaped footage of themselves on the big screen, with moans at the capsizes and cheers at the successful manoeuvres.